"The Way of the Canoe is the Way of the Wilderness and of a Freedom almost Forgotten." "There is magic in the feel of a paddle and the movement of a canoe, a magic compounded of distance, adventure, solitude, and peace. The way of a canoe is the way of the wilderness, and of a freedom almost forgotten. It is an antidote to insecurity, the open door to waterways of ages past and a way of life with profound and abiding satisfactions. When a man is part of his canoe, he is part of all that canoes have ever known." 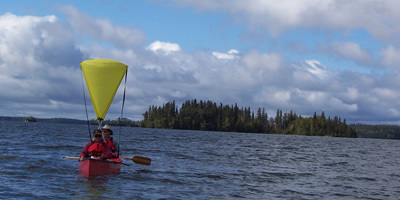 Travel by Canoe is Part of Canada's Heritage. To Travel Safely upon the Vast Wilderness Waterways of Canada you will need a Knowledge of Trip Planning, Route Selection, Menu Planning, Nutrition, and Equipment. 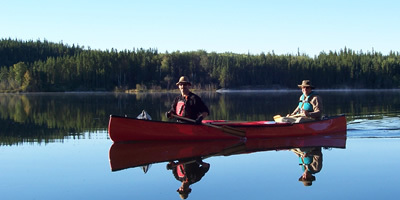 As well you will need to understand and practice the basic Canoe Tripping Travel Skills including; Paddling, Portaging, Poling, Lining, and Sailing. Extended Trips in a Canoe up to 120 days are both possible and very rewarding. You just need to plan well and learn the basic skills before the day you start paddling.